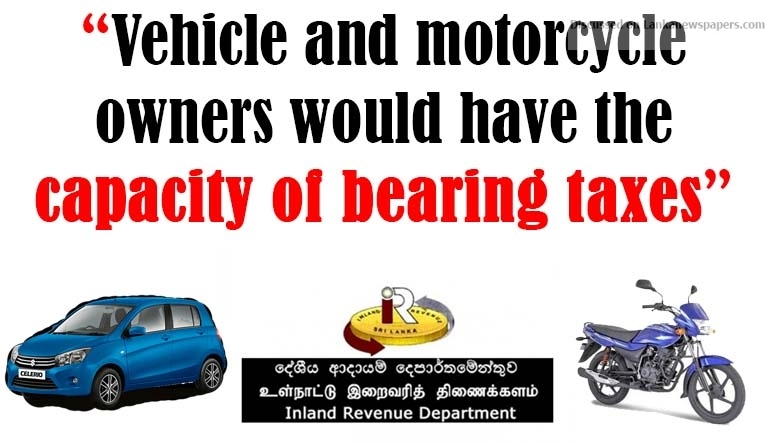 Commissioner of the Inland Revenue Department Ivan Dissanayake has stated that vehicle and motorcycle owners would have the capacity of bearing taxes, given that they go through monthly obligations such as maintenance charges, fueling charges and insurance charges. Commissioner Dissanayake also added that those who travel out of the country on foreign trips also have the capacity to pay taxes. Therefore, the commissioner urged everyone, to come and register as a taxpayer and fulfil their responsibility. “The Inland Revenue Department has currently created inter relationships with 32 organizations and according to the information obtained by those organizations, if we are informed that you are in a position to pay tax, and take steps to open new tax papers for you, we would be carrying out investigations on the sources of income belonging to those people” he continued. Meanwhile, speaking at a press conference, MP Rohitha Abeygunawardena of the JO also commented on the prevailing tax issue of the country. MP Abeygunawardena stated that tax policies and tax increments of a country should be constructed in such a way that the people would be able to benefit from the revenue gained through tax. “By providing the necessary infrastructure facilities, bringing in foreign investors required for investments to the country is when the country would develop economically and that is when taxes should be implemented, that is the general practice” commented the parliamentarian. “In Sri Lanka the case is different. The dollar has depreciated up to 162 rupees, enterprises are running at a loss, and loan instalments cannot be paid. – When the people face difficulties to even fulfil their basic needs for daily meals, the government requests to open new tax papers.” he added. motor cycles have become a common mans mode of transport instead of the public transport which has no comforts at all. the public transport is crowded, have no proper fares, and sometime has no proper timely service. so the only option is to have a motor cycle which is convenient and comfortable for all purpose. as such, taxes on motorcycle is very unfair and whoever imposed such tax should first experience the difficulties the public is undergoing.